Each black stone circular platform raised above a faux-bronze painted plaster foliate wreath above a standard comprised of three outward-facing bare-breasted maidens standing on a plinth of architectural scrolls with animal paw feet on an iron-rimmed circular base. The bases are signed in the plaster: February 4, 1812, H. Hopper London. 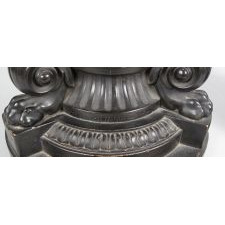 Condition: Excellent: Minor chipping to the base of one pedestal, now restored. Scattered minor imperfections with old restorations. At some point in the mid-19th century, these candelabra were piped for gas, necessitating a 1.25 inch channel cut into the side of the iron-rimmed base to accommodate a gas pipe that ran up through the center of the base to the top where the original hole for fitting the lamp was, and where it would have fed a brass gas lamp. Now, a later black stone platter has been fitted, with a plug, into that original central hole in the top of the plaster. Originally, either a brass candle holder or Argand lamp fixture would have been fitted to the top of these torcheres. Humphrey Hopper, located first at 55 Paddington Street (1799-1801), then at 14 New Road, Fitzroy Square (1801-1807), then in Edward Street, Portman Square (1807-1815), thereafter at 13 Wigmore Street (1815-1834), was the most successful of the many Regency plaster modelers, a group that included Benjamin, Robert and Charles Shout, G.D. and G.B. Giannelli and Alexander Sarti. 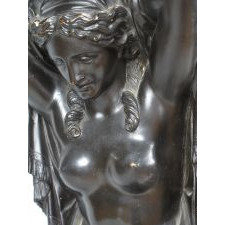 He entered the Royal Academy Schools in February 1801 and exhibited often at the Royal Academy between 1799 and 1825 and again in 1834 including monuments and monumental figures, busts, and figures for chimney pieces, sometimes specified to be in marble. 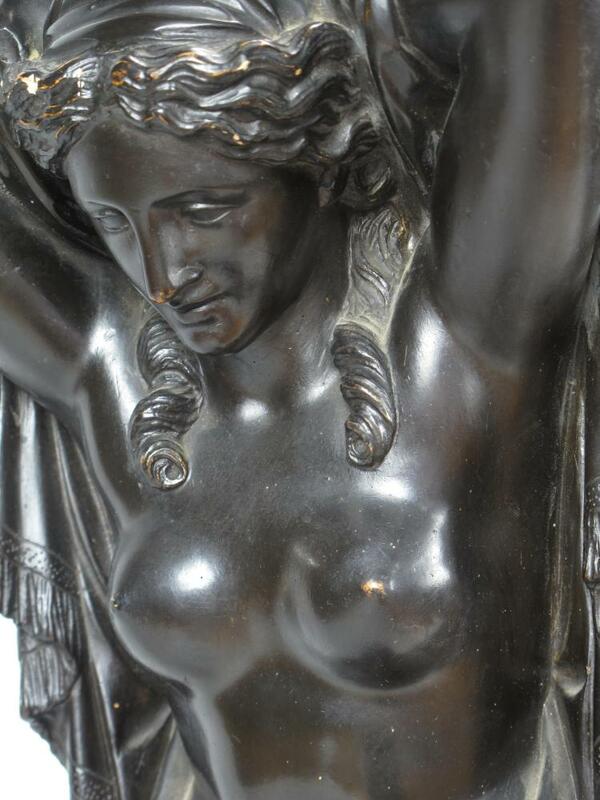 He won a silver medal in 1802 and the Academy's gold medal for his sculpture "Death of Meleager" in 1803. Four signed Hopper classical figures designed as lamp holders survive at Lancaster House, London. Hopper sculpted the monument to Major General Andrew Hay (1762-1814) at St. Paul's Cathedral, London and a pair of gilded brackets in the collection of the Victoria and Albert Museum. He is buried in Kensal Green Cemetery, Harrow Road, London. 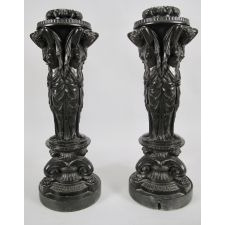 The design of these pedestals was inspired by such widely-known images of classical antiquity as those published by Giovanni Battista Piranesi, a veritable lexicon of classical symbols, or drawn, in the same spirit, from Greek and Roman myths. In his highly influential 1778, Vassi, candelabri, cippi, sarcofagi, tripodi, lucerne, ed ornamenti antichi...Piranesi published a "Granite cistern supported by four fauns resting on a base," from Cardinal Albani's Villa dell' Emo, which is the likely source of the inspiration for these, although it would seem that two other Piranesi plates from the same volume were known to Hopper and influenced this work. Two views of a pedestal "Marble candelabrum found at Hadrian's villa" has a kneeling faun supporting the platform with his arms back and elbows out, in the same pose as the present maidens. And in "Group of three women in the Villa Borghese" three standing women form a pedestal base. 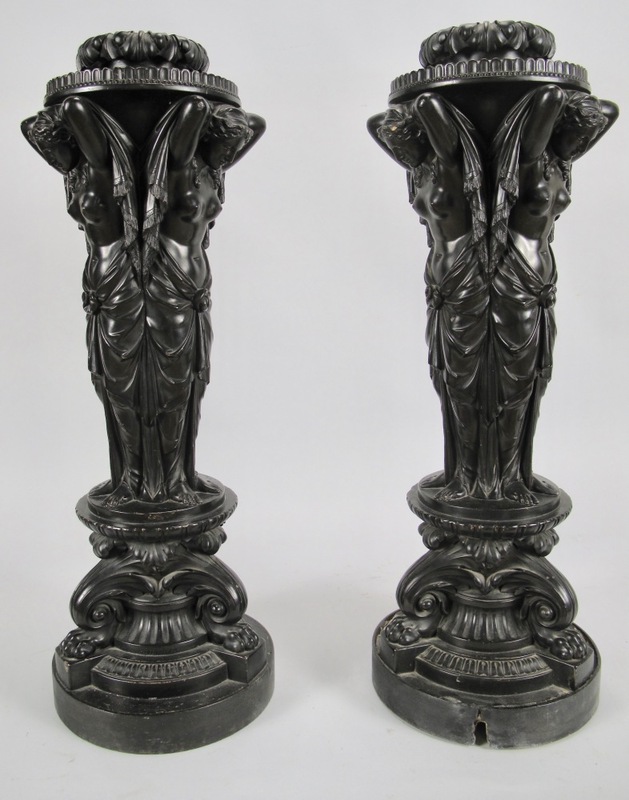 In the early 19th century, the appropriateness of using classical figures to form a lamp pedestal, or "candelabrum," would have been broadly appreciated by elite consumers of luxury products such as these. Related candelabra made in bronze by Vulliamy appear in an illustration of the circular drawing room at Carlton House, the stylish palace designed by Henry Holland for the Prince Regent, in William Henry Pyne's views of [The History of] Royal Residences (London: A. Dry, 1819). Plaster figural torchères by Hopper and his competitors are found in many of the great English country houses and palaces but this form by Hopper is unknown. The dark paint or "faux-bronze" surface is typical of these plaster figures. Note: Years ago, we handled an extraordinary set of lacquered brass Argand lamps with a matching Sinumbra lamp that had the exact same adorsed female figures comprising the base of each lamp. It now seems highly likely that Hopper was the artist that created the original sculpture from which the lamp bases were created by Thomas Messenger and that this may offer a window into an otherwise unknown aspect of Hopper's career. Timothy Clifford, “The Plaster Shops of Rococo and Neoclassical Era in Britain”, published in the Journal of the History of Collections, vol. 4, No.1, (Oxford University Press, 1992), 39-65, and Algernon Graves, F.S.A., The Royal Academy of Arts: A Complete Dictionary of Contributors and their Work from its foundation in 1769 to 1904 (London: Henry Graves & Co. LTD., 1906), 152. Jonathan Bourne and Vanessa Brett, Lighting in the Domestic Interior (London: Sotheby's, 1991), 178. The bronze candelabra depicted at Carlton House, are part of a group of sixteen supplied for the Circular Drawing Room in 1810-14 by Benjamin Lewis Vulliamy (1780-1854), and remain in the Royal Collection at Buckingham Palace and Windsor Castle. Measurements H: 39" Dia. 15"